Original Music Workshop's next event will take place within the under-construction shell of the building on May 30th and will feature works and performances by Helga Davis, Laurie Anderson, Jeffrey Zeigler, Philip Glass, Tim Fain, Maya Beiser, Erika Harrsch, Bryce Dessner, and Suzanne Vega. Netsayi & Black Pressure perform live at Original Music Workshop for the latest in the series of pre-opening events at OMW. Last night we performed with Assume Vivid Astro Focus at the Guggenheim Museum as part of the Eye to Eye series. We created a sort of soundscape somewhere between the Velvet Underground and Kraftwerk, but noisier, more abstact, and surely not as good. Our set was surrounded on all sides by Kandinsky paintings. We actually were required to keep our distance in case of a catastrophic technical failure. We perform again tonight. 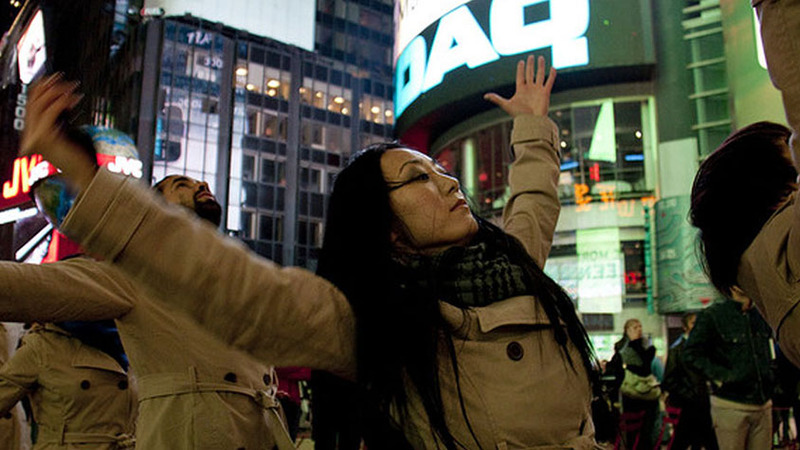 Somewhere I Read is a processional performance event in Times Square that was commissioned for the opening of Performa 09 and was developed in partnership with the Times Square Alliance Public Art Program. Designed in collaboration with musician Arto Lindsay and choreographer Lily Baldwin, the piece features 50 trench coat clad dancers equipped with cellphones that transmit and produce a live musical soundtrack. More images here. Here are two views of Autopilot, the play we set designed, at the Walt Disney Concert Hall in Los Angeles, CA. Here's a close up of a vitrine we designed as part of the set for Autopilot, the play conceived by playwright Jane Pickett and director Lars Jan. Autopilot premiered last week at the Walt Disney Concert Hall in Los Angeles and is now en route to the Edinburgh Fringe Festival.